The life insurance industry faces five distinct underwriting challenges—labor, speed, efficiency, pricing, and mortality. Boston, January 7, 2016 – The U.S. life insurance industry is plagued by many issues, including inefficient underwriting processes. In recent years, improving underwriting has been front and center at many carriers because it’s the number one issue most new policyholders gripe about and the first place insurers can positively impact the customer journey. Many carriers still have a long way to go, though, and many insurers remain unaware of the full extent of solutions available to improve their underwriting process. This report examines the range of vendor solutions that life insurance companies can tap into to address the underwriting process’ five pain points: labor, speed, efficiency, pricing, and mortality. 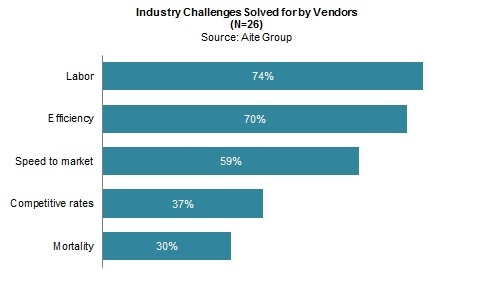 It identifies the vendors within each challenge category, compares their abilities, and awards vendors for their strengths and methods. The vendors evaluated are Accenture, Apptical, Clinical Reference Laboratory, Computer Sciences Corporation, Ebix, ExamOne, Examination Management Services Inc., Hannover Life Reasssurance Company of America, Hexaware Technologies, Image Process Design, Innovative Underwriting Solutions, LexisNexis Risk Solutions, Majesco, Milliman, Munich Re Automation Solutions Ltd., Oracle, Pegasystems, Resonant, Reinsurance Group of America, Scor, SelectX, Step Solutions, StoneRiver Inc., Swiss Re, Synodex, and Tata Consultancy Services. This research is based on qualitative interviews with senior IT executives at top life insurance companies regarding their current strategies and integrations, and qualitative interviews and demos with life-specific underwriting vendors. This 58-page Impact Report contains 13 figures and three tables. Clients of Aite Group’s Life Insurance service can download this report.